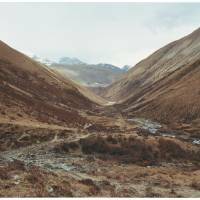 The walkways, ravines and peaks of the Himalayas, Tibet and Swiss Alps form the backdrop for “On the Mountain Path,” the latest photographic exhibition by Nao Tsuda at Gallery 916. 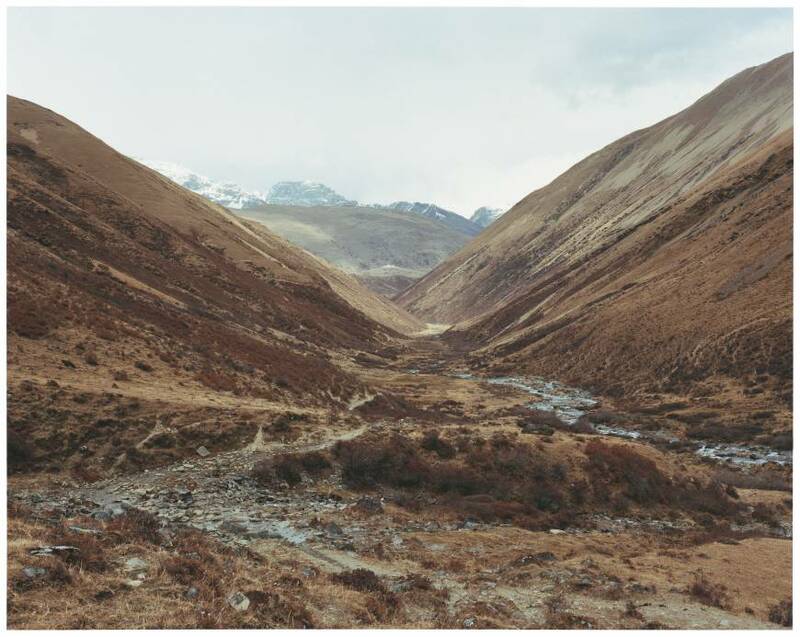 Tsuda’s sizeable photographs show one man’s appreciation for landscapes’ resilience to inconstant climate and changing ways of life — from the Valais region of Switzerland (“Noah”) and the Chomolhari trek in Bhutan (“Reborn (Scene 3)”), to the Philippine island of Luzon (“Puhu nin Amukaw,” the Aeta name meaning “The Heart of Banana”) and up through the massive gray rock of Mount Pinatubo, a volcano that became one of modern history’s largest natural disasters when it erupted in 1991. Born in Kobe in 1976, Tsuda repeatedly walks across landscapes to take photographs, relating each path he takes with his theme of photography’s relationship with time. For the most part, he sets out unaided by maps or other tools of navigation, instead using old tracks as guides. These routes, formed by past walkers and renegotiated by locals, echo the indigenous peoples who reside there, such as those living along the Chomolhari trek that, with its peak sitting on the border between Bhutan and Tibet, has managed to survive not only shifting geography and cultures but also political unrest. With each photograph, the challenges facing the walker are represented in the precarious condition of its path. Tsuda photographs Swiss workmen building footpaths in Valais, preparing fragile bare ground. He captures wooden paths so precarious that they seem unpassable and attached to the face of Alpine rock by faith alone. Along one Alpine path, a reminder of such faith and trust appears in the form of a cross found at a rest stop that becomes a respite from, as well as warning of, the potential dangers that lie ahead. Meanwhile, the Bhutan landscape at first light is barely seen at all. In one image, like the route itself, it is almost indefinable. The Philippine landscape is altogether different. Previous paths are replaced by floodplains and estuaries. From a grassy bank, Tsuda looks back over the land and river beds that bleed away from neighboring mountainous terrain. A ritual of preparing food in honor of the departing walkers takes place, and fresh banana hearts, set alongside heaps of rice all wrapped together in banana leaves, are cooked by local Aeta as part of a farewell celebration. Scottish poet Nan Shepherd, who was an avid walker, wrote about her “circumambulation” of the Scottish Cairngorm mountains in her book “The Living Mountain.” Writer Robert Macfarlane then recounted Shepherd’s experience in his book “The Old Ways: A Journey on Foot,” with her imagery of the Highland landscape drawing readers into a place that “might make possible particular thoughts.” Likewise, Tsuda’s images, his own photographic thoughts, tap the landscapes he navigates to suggest a sense of place that is unexpected. However remote they are, these mountainous paths retain the ability to welcome and draw you in, despite their perilous nature.